Few painting contractors guarantee their work like we do. We back up our interior and exterior painting work with a warranty. It’s part of our company identity that we are part of the Northern Colorado community. 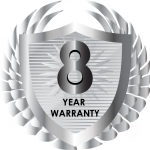 To that end, we offer an 8 Year Warranty on all Residential Painting work we perform. What that means to you, the customer, is that if our work fails in any way (excluding fading, damage done by the homeowner, and damage done by hail, wind or natural elements). It is also required that the homeowner rinse their home 3-5 times a year to ensure longevity and quality. In addition, siding must be in repairable shape and not holding moisture. Distinct Painting Company, LLC., offers an 8 year warranty on all residential interior and exterior work we perform. If our work fails due to product failure, outside of the exclusions listed below, we will repaint at no charge to you. Exterior Exclusions: Fading, damage done after completion of work, damage done by hail, wind, or natural elements, sprinklers, failure due to the failure of or damage to the underlying structures, such as stucco cracking, water intrusion, and shifting. Warranty excludes deck, any staining work, prior repairs done by other contractors, gutter failure or lack of gutter installation, anywhere snow or water accumulates. Interior Exclusions: Painted surfaces must be kept clean. Warranty excludes damage due to use of cleaning chemicals, ghosting or damage from smoke or burning in the home.